After all the leaks and rumors, the Samsung Galaxy Note for T-Mobile has been officially announced by the carrier itself. Phablet fans who are interested will be able to grab one within a few weeks, either online or at select T-Mobile locations throughout the U.S. In terms of hardware, the Samsung Galaxy Note for T-Mobile is not much different from the AT&T model. Inside it hums a dual-core Snapdragon S3 processor clocked at 1.5GHz, and its 5.3-inch Super AMOLED HD display has a resolution of 1280 by 800 pixels. On its back we have an 8-megapixel camera and a 2-megapixel shooter for video chats is located on its front. Not to be forgotten is the S Pen capacitive stylus, which is ideal for taking notes on the fly. We have to point out, however, that while the AT&T Galaxy Note supports LTE, the T-Mobile variant relies on 42Mbps HSPA+ connectivity. On the software side, it is nice to see that the T-Mobile Samsung Galaxy Note comes with Android 4.0 Ice Cream Sandwich out of the box, with all Premium Suite goodies pre-installed. That includes the S Note and S Memo applications, which get along really well with the S Pen. So there you go, folks! Most of the spicy details about the Samsung Galaxy Note for T-Mobile have been unveiled. The only thing missing from the equation is pricing, but we expect to know more on the matter sooner than later. BELLEVUE, Wash., - July 17, 2012 - T-Mobile USA, Inc., the No. 1 mobile operator brand in Samsung Galaxy S(tm) sales, and Samsung Telecommunications America (Samsung Mobile), the No. 1 mobile phone provider in the U.S. and the No. 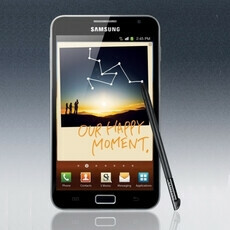 1 smartphone provider worldwide, today announced the upcoming availability of the Samsung Galaxy Note(tm). One of T-Mobile's fastest devices leveraging its 4G (HSPA+ 42) network and running on Android(tm) 4.0 Ice Cream Sandwich and Samsung's Premium Suite, the Galaxy Note provides an innovative, all-in-one experience that is perfect for work, play and everything in between. Consumers are demanding larger smartphone screen sizes. In fact, a recent T-Mobile survey showed 77 percent of consumers prefer a device with a 4.5-inch or larger display rather than a smaller screen. The Galaxy Note speaks directly to that demand with a 5.3-inch HD Super AMOLED(tm) touch screen - the largest screen on a T-Mobile(r) smartphone. The device is elegantly designed to handle both business and home tasks with ease. The Galaxy Note with Premium Suite provides a range of productivity-enhancing features, such as the S Pen(tm), S Note, S Memo(tm) and Polaris Office. Now T-Mobile customers can write notes, to-do lists and annotate documents; share ideas and edited content; and create documents, presentations and spreadsheets to maximize efficiency while on the go. S Note helps to professionalize communications by providing templates for seven commonly used documents such as an idea note, travel notes, diary entry, meeting notes and recipes. S Note also allows you to import and annotate a PDF file and convert dictated or handwritten memos to text with the Continual Voice Input and Handwriting-to-Text features. With S Memo, Galaxy Note users have one-touch access to creating a typewritten, handwritten or voice dictated memo; researching information during creation; and adding an image. The Galaxy Note also has the SAFE (Samsung Approved for Enterprise(tm)) designation, which means it has a full suite of enterprise-ready features and capabilities, including comprehensive IT policy support for top-tier mobile device management (MDM) providers, on-device AES256-bit encryption, enhanced support for Microsoft Exchange, as well as integrated support for a range of virtual private network (VPN) solutions. The Galaxy Note also provides Wi-Fi Calling capabilities and, with a qualifying rate plan, can act as a Smartphone Mobile HotSpot for up to five devices. "In addition to larger screens, today customers demand more from their devices - from having safeguarded access to corporate email and other productivity features to being able to rely on a speedy network for streaming content," said Andrew Morrison, vice president, product management, T-Mobile USA. "With the unique and highly innovative Galaxy Note in our lineup, we are even better equipped to help our customers strike the perfect balance as they juggle both professional and personal activities." Featuring a snappy Qualcomm(r) Snapdragon(tm) S3 Processor with 1.5 Ghz Dual-Core CPUs, the Galaxy Note provides customers with incredible 4G experiences, making it the perfect all-in-one device to maximize efficiency and productivity, in addition to fun. The Galaxy Note offers a variety of entertainment experiences, such as T-Mobile TV in mobile HD3 for watching live TV programming, Samsung Media Hub for renting and buying the latest movies and TV shows, and Google Play Music for streaming and purchasing music. The Galaxy Note also features an 8-megapixel rear camera and a 2-megapixel front-facing camera, to capture pictures and HD videos to share with friends, family and social networks. wayyyyyyyyyyyyyyyyyyyyyyyyyyyyyyyyyyyyyyyyyyyy too late for this. don't even bother with this and get the SIII. hey, if you own a Note and love it that's great but if you had to make the choice now what choice would you make? i own an awesome device thank you very much. Ur right man i just got the GS3 on Verizon and i love it. Its so smooth and fast it beats my new ipad in speed. Its a beast!!!!! lets get back to the nexus one...lmao!!!! This is a T-mobile Galaxy Note Party. All you haters with small hands need to leave! !